Engineering is a big part of science, so a simple machine project with my 5 year old was the perfect addition to our DIY summer science camp. I had originally planned an afternoon of building with a bag full of goodies to inspire tinkering, but it turned into a playful session with a pulley. I had two different sizes of wheels (I found them in the hardware store, but any wheel with a groove will do) in our inventor’s bag along with some long rope. My 5 year old was immediately drawn to the wheels but I was the one who suggested we thread the rope through the grooves and turn it into a pulley. I hung it from a hook in our window and we tied a stick to one end. I just happened to have a jar of sticks in the window (I know, that’s sort of weird) and it seemed like a good idea. It acted as a sort of make shift handle and also prevented my son from pulling the rope all the way off the wheel. 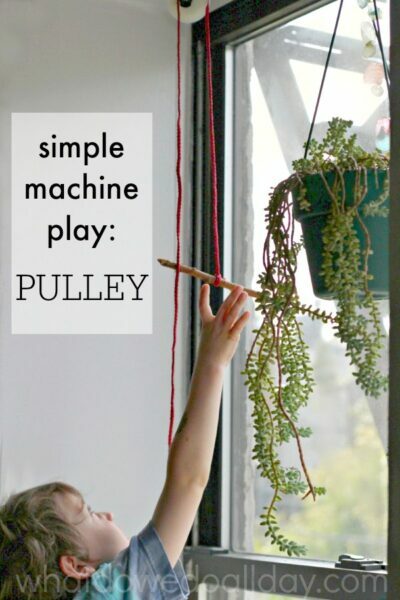 I can’t believe how long New Kid played with this simple machine. He loved pulling it back and forth, trying to reach the other end, etc. We tried both size wheels and also tied a stick to each end, not just one. If you look closely, you can see that he decided to give a finger puppet shark a ride. Who knew a pulley could be such fun? Stay tuned for more simple machines projects! The classic way to use a pulley, is of course, with a bucket! Later on, we tied a bucket to the string and, standing out on the fire escape, we lowered a bag of cookies to our neighbors in their backyard. I see more special deliveries in our future! 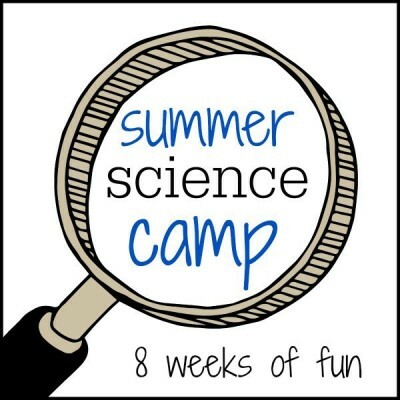 Don’t forget to head over to Coffee Cups and Crayons to see what Megan and her kids are concocting this week in Science Camp! ummmm….this is rad! I love pulleys! At the Boston Museum of Science they have a simple machine set up where you can lift a one ton weight, always fascinates me. It would be fun to attach a cup and put a guy in it and turn it into an elevator. I actually ended up setting up another pulley with a cup at each end and it has been a hit! This is rather cool. I didn’t know that you can buy a pulley wheel at the hardware store!